About Ten Thousand People Attended A Rally In Dublin In Memory Of Savita Halappanavar | Flickr - Photo Sharing! 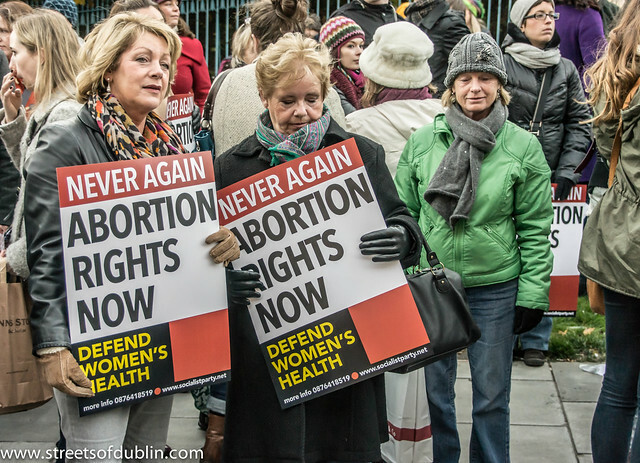 Today a large number of protesters took to the streets of Dublin in response to the unfortunate death of an Indian woman who was refused an abortion. The 31-year-old woman died following a miscarriage at University Hospital Galway. The story behind my photographs has been well reported by international media including CNN, the BBC World Service, Channel 4 News, Sky News, the Sydney Morning Herald, France 24 and New Delhi Television (to mention but a few). Zeenews New Delhi: "The death of an Indian dentist in Ireland, whose life could have been saved through an abortion on Thursday sparked outrage in India with political parties terming it as a violation of human rights while her parents demanded an international probe"
Halappanavar's parents demanded an "international probe" and said Irish law on abortion should be changed. "Only following rules, what about humanity? They killed my daughter to save a foetus. Only a mother knows the pain," said Halappanavar's mother, while her father urged the government to act accordingly. There is another protest scheduled for Wednesday in Dublin.